Homeowners insurance is not only recommended by most mortgage companies, it is often required. 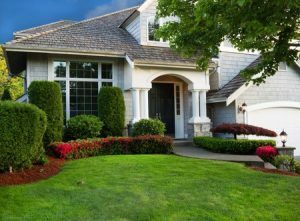 Homeowners insurance is an important part of protecting your finances and often sold as a package policy that covers both damage and liability. Most disasters will be covered by standard homeowners insurance policies. This includes damage caused by fire, hail, lightning, windstorms and other typical weather events, as well as vandalism, theft and more. Liability coverages are to protect you against claims that visitors and guests may be able to make against you in the event they suffer from a personal injury or incur their own property damage (cars, etc.) while visiting your property. Should someone break a leg in the backyard or fall down your stairs, a good homeowner’s policy should protect you. Damage caused from major floods, hurricanes and earthquakes are often not included in your standard homeowners policy. This is because many regions don’t carry a risk for these extreme events, while others are far more risk-prone. It is for this reason many regions will require a separate hurricane, flood or earthquake policy. For current homeowner’s, earthquake, hurricane, or flood insurance rates, simply speak to your professional Five Brothers Insurance agent. At Five Brothers Insurance, our policyholders are family, and each is provided with the personal time and attention they deserve from an insurance agency. We have been providing homeowners insurance, along with a host of other personal and commercial insurance policies, to Floridians for nearly three decades, and our dedicated team looks forward to finding you the most comprehensive and affordable policy available. We are currently providing homeowners and flood insurance rates to home and business owners in Tampa, South Tampa, Safety Harbor, Tarpon Springs, Oldsmar and throughout Florida, so contact us today to speak to an experienced Five Brothers Insurance agent about your insurance needs. We are happy to shop around for a new homeowners insurance policy or review your current plan to ensure you’re covered where you need it most. Whatever your insurance needs, we can help!